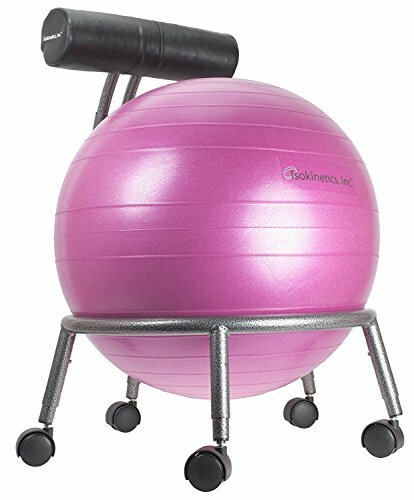 Ball chairs provide a different sitting experience than regular chairs. They force you to sit up straighter and many people simply prefer them over regular chairs. We provide all of our chairs AND balls with a 1 year guarantee. As an additional bonus, we provide an exclusive exercise ball measuring tape that takes the guesswork out of inflating your ball. Many people report sitting on an exercise ball while at home or work promotes flexibility, coordination, motor skills and balance. It may take a few days before your body becomes accustom to sitting on an exercise ball. Start by using it 10 to 15 minutes a day and gradually work your way up. If you have had back problems or injuries, make sure to consult your physician or therapist first. Note: We provide a small pump for free for you to have a way to inflate your ball. However, exercise balls require a lot of air and it will take a lot of pumping with the free pump. So, you may want to consider purchasing at this time a high volume air pump, especially if you use exercise balls a lot or have other things you often inflate, like pool toys or air mattresses. Search YouTube ("isokinetics inc.") for our exercise ball inflation video. If you have any questions about this product by Isokinetics, contact us by completing and submitting the form below. If you are looking for a specif part number, please include it with your message.